Hidden behind the frustration of an 0-2 start and the soap opera of Kam Chancellor’s holdout is a developing story that Seahawks fans should keep an eye on. Your franchise quarterback is different. At least, his numbers are. 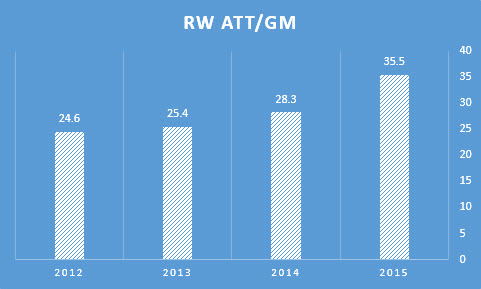 Through two games, Russell Wilson is striking a very different profile than what he has in the previous three years. Some of it is good. Some of it is bad. Some of it may not be about him at all. Let me introduce you to your new quarterback. Time will tell if he is just visiting, or here to stay. Wilson set franchise records in his first and second years for passer rating. He set an NCAA record for pass efficiency his senior year at Wisconsin. Throwing a lot of touchdowns, throwing few interceptions and throwing for a large number of yards per throw is who Wilson has always been. That has changed a bit so far this year. 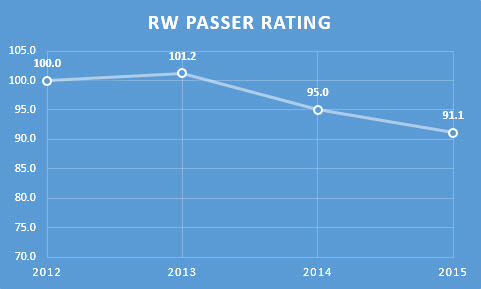 Wilson’s passer rating through two games would be a low water mark for his career if it remained at this level. That is mostly due to an uncharacteristic two interceptions in two games, but it is more than that. His yards per attempt (6.4) is miniscule compared to his career average. That is largely due to the fact that so many of his throws have been closer to the line of scrimmage. Those wide receiver screens to Doug Baldwin and Tyler Lockett are not yielding big yards, even when they work. The short passing game is showing up in the percentage of passes Wilson has attempted that traveled more than 20 yards in the air. He has been one of the most prolific deep passers in football through his first three seasons. Not only has he attempted a high rate of deep throws, but he has completed a much higher rate than the most quarterbacks. He was the best deep thrower in football in 2013, per ProFootballFocus.com. It is concerning to see the team move away from something that is such a strong part of his game. 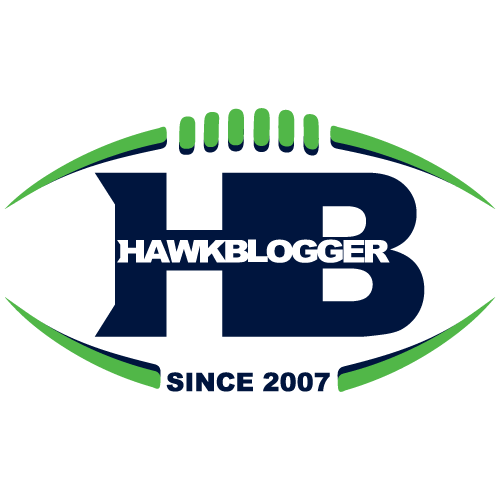 We have yet to see a jump ball thrown down the field to Chris Matthews, Jermaine Kearse or Jimmy Graham. It is not all bad. Pete Carroll talked about challenged Wilson to complete 70% of his passes last year to start the season. He is doing that through two games. Those shorter throws are easier to complete, and while the jury is out on whether they accentuate the strengths of Wilson as a trigger man, they take some pressure off of him and his offensive line. 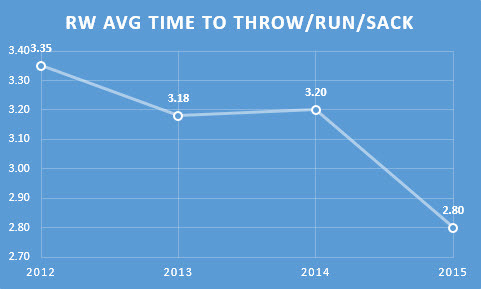 The above chart shows the average time it has taken Wilson to either throw, scramble past the line of scrimmage or get sacked. I have hammered him on this number for his first three years. The best quarterbacks in the NFL, the experienced quarterbacks in the NFL, are at the opposite end of this stat than Wilson has been. He literally has been the worst in football at putting his line in a tough position to block for the longest time and the worst at getting rid of the ball on time within the framework of the offense. He has made significant strides here, and is now in the middle of the pack through two games. 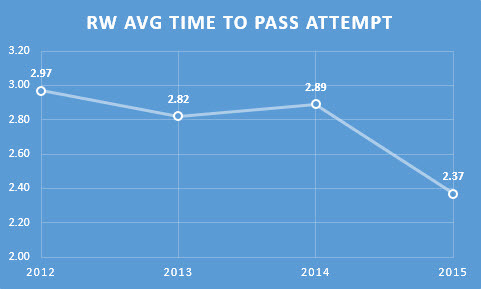 This chart shows Wilson’s average time to attempt a pass. This removes scrambles and sacks. It is just the average time it takes Wilson to let the ball fly. This is an even more impressive leap. He is currently 10th in the NFL in this number, above the likes of Matt Ryan and Tony Romo, and within range of a guy like Peyton Manning (2.20s). That is a colossal shift. 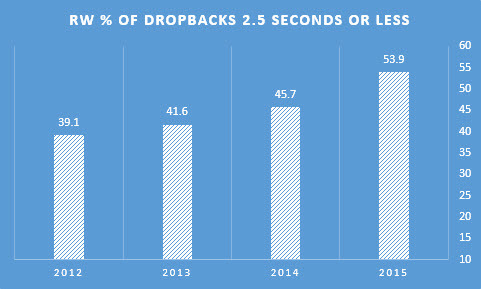 As you can see, the percentage of all Wilson dropbacks (which includes sacks and scrambles) that take 2.5s or less has eclipsed 50% for the first time in his career. 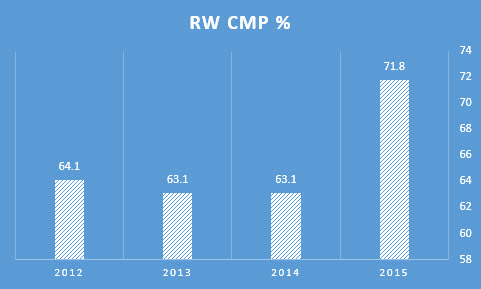 He has made steady improvement in this area. Although, some of this is attributable to the play calling of Darrell Bevell making short throws a bigger part of the game plan. Everyone knew the Seahawks were going to have some trouble with the offensive line early on as this young group started to work together. The game plans had to have taken that into account. There is evidence, though, that the coordinators and the quarterback can start to trust that group more in pass protection. Wilson is being pressured less than at any other time in his career. Go back and watch the second half of the Packers game. Wilson threw the ball a lot, and the pocket was clean almost the entire time. It was only when the coaching staff decided to trust that line in pass protection that the offense was able to get untracked. Wilson posted a 98.8 rating and 7.2 YPA the second half of that game, after struggling with a 77.9 rating and 6.2 YPA in the first. His completion percentage was 65% in that second half which is plenty. 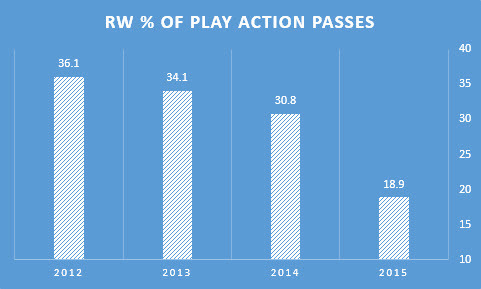 That goal of 70% completion rate seem counterproductive to the type of player Wilson is. If pass pressure is a primary concern, one of my questions is why the team has abandoned the play action pass. A proven way to keep pass rushers off your quarterback is the play action pass. Seattle has employed it to great result in Wilson’s career. It is rare for quarterbacks to come out of college with this ability, but Wilson is rarely gifted in this aspect of quarterbacking. I can only hope this was done due to concern about the offensive line and Wilson having his back to the line of scrimmage, and that now that the group has weathered the early storm, this will return. Not only can it ease pressure, but it is where many of the Seahawks deep throws have come from in the past. This strength of Wilson’s connects well with his deep throwing strength. I question any decision to move away from his strengths. Seattle and Wilson have ranked at, or near, the bottom of the league in pass attempts every year of his career. That has changed this year. Wilson and the Seahawks rank 17th in the NFL in pass attempts through two games. Some of that is definitely due to playing from behind, but Seattle has rarely turned to the high volume passing game when they trail. They stick to the run. Look at the NFC Championship game for the most stark evidence of that philosophy. 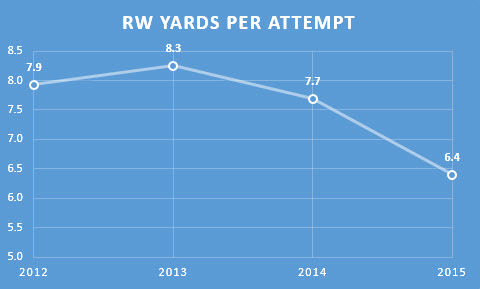 This is more likely a situation where the team is experimenting with replacing runs with short passes. That is why a player like Doug Baldwin is on pace to break the franchise receptions record through two games, and why his yards per reception is the lowest it has been in his career. I am not convinced this is a positive direction for the Seahawks offense, but I understand why they are exploring it. Yep. It is just two games. They were both on the road. Both opponents represented significant challenges for different reasons. Still, the philosophy and the results have been different than what we are accustomed to. We saw a similar departure at the beginning of last season when the team tried to incorporate Percy Harvin into the offense. They seemed to learn their lesson that trading tough Marshawn Lynch runs for finesse receiver screens was not who they are or who they want to be. Many teams feel pressure to elevate the way they use their quarterback after he gets a big contract. I hope that is not the case here. Carroll has been true to his philosophy since he arrived, and the passing game taking the back seat to the running game has always been core to that philosophy. My hope is the staff and Wilson can find a way to keep some of these positives, like the quicker decisions and increased completion rate, without abandoning the things that make Wilson special like the play action passing and deep throws. It would not surprise me to see the offense open up a bit more this week coming home against a team with a suspect pass rush and gain the confidence they need to realize the potential of this offense.